So, you’re going to Kauai. And you play golf. You are therefore thinking of playing some golf on Kauai. That is a really good idea. Here are the Garden Island’s seven public-access courses. Ideally, you can play them all. The par 3 3rd - see what I mean? After two fine but fairly gentle holes to open the round at Princeville Makai on the island’s north shore, you stand on the tee of the par 3 3rd and just gaze. Is this view for real? The hole itself is a sweet, downhill 181-yard mid/short iron played over a pond to a green with two large bunkers front and back. But it’s what lies beyond the putting surface that makes this hole so unforgettable. A pocket of fairly dense vegetation, dotted with red Brazilian tulips, sits in front of the whitewashed St. Regis hotel with the semi-circle of Hanalei Bay, the Wainiha coast and Mt. Makana looming in the distance. It is quite overwhelming, and the first of a handful of moments on this Robert Trent Jones Jr-design where you just have to pause and thank whatever circumstances in your life lead you to this surreally beautiful place. The equally stunning par 3 7th. 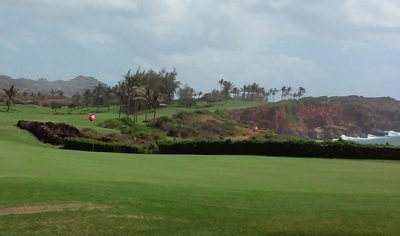 The 27-hole Makai course was Jones Jr’s first solo design and opened in 1971. 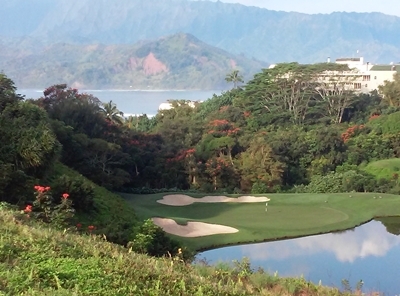 Jones returned in 2009 to renovate the Lakes and Ocean Nines turning them into the 18-hole Makai Course, and leaving the Woods Nine for those looking for a quicker, more casual game. Jones’s artistry saw the Makai Course climb significantly in the rankings, breaking into America’s top 100 public courses in Golf Digest and rising to Hawaii’s fourth best public-access course in Golfweek. Rack Rate - $275, Resort Rate - $205. Woods Course - $55. The par 3 14th - golf at its most exciting. The last time I was here, the place was called Kauai Lagoons, it was a Marriott Vacations Worldwide resort, and there were 36 holes of golf – the Jack Nicklaus-designed Mokihana and Kiele Courses. A lot has changed since then. The golf was reduced, first to 27 holes, Marriott sold to a Hawaiian developer for $60m, and Colorado firm Timbers Resorts which operates in 15 locations in the US, the Caribbean, and Mexico was bought in to manage the 600-acre property re-named Hokuala - Hawaiian for ‘Rising Star’. Timbers is working on an $800m project to totally renovate and upgrade the resort that will include a boutique hotel, condominiums, town homes, and residences. The golf? Currently, there are just 18 holes – the Ocean Course which is made up primarily of the old Kiele with three new holes - the 10th, 11th, and 15th. 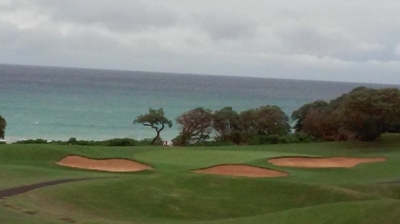 It works really well, especially the formidable stretch of ocean holes on the back nine. Timbers is considering adding a second course that would likely open in 2018. I was familiar with a lot of the Ocean 18, having taken on the Kiele nearly a decade ago. But the re-working of the layout and addition of the new holes has helped make it a truly marvelous round. Every hole has something about it, be it jungle, lake, open desert-like terrain, or ocean. There are some nice run-up shots to be played, and a few forced carries from the back two sets of tees. This variety adds up to a very engaging collection of holes, made all the more appealing if a northeast trade wind is tugging at the flagpoles. The highlights on the front are the short but demanding 5th which plays 219 yards from the back and requires a carry of about 190 yards, and the par 5 6th where the tee shot must carry a stretch of jungle lying in a canyon. 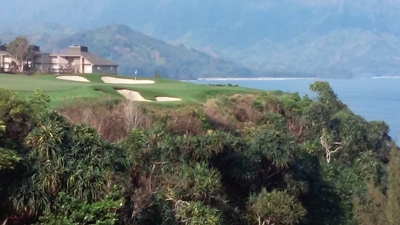 The downhill pitch to the 16th with Nawiliwili Harbor behind. It’s a thrilling hole, but really rather tame compared with what's to come. The excitement builds as you approach the green at the 13th which is backed by a string of palm trees and the wild, blue, Pacific beyond. You then head down to the tee at the short 14th and, as you did on the 3rd at Makai, you begin to appreciate everything in your golf life so far has been building up to this glorious moment. The green is on the other side of a chasm, the crashing surf below you and the pin 210 yards distant. You can bail right if you like, but who does that? This is one of the greatest do-or-die shots in the world. When you do, and it comes off, the feeling is magical. If you die, the letdown is profound but at least you tried. Next time, eh? The 16th is a quirky, short par 4 with a fun, little downhill pitch to the green. The 17th is a par 3 across water, and the final hole requires a stout drive and mid/short-iron across more water to a peninsula green. It's tough certainly, and yet incredibly entertaining. Rack Rate - $205 before 12pm. $135 after noon. $105 for nine holes. Looking back down the 16th from behind the green. I don’t know what it was, but the first time I played Poipu Bay, I was underwhelmed. I’m not sure if it was because I played badly, felt designer Robert Trent Jones Jr. could have made more of the ocean, there wasn’t enough wind to make it really interesting, or I’d had a bad burrito for breakfast. But I left thinking the course hadn’t quite lived up to expectations. Eight years later, I realize I got it wrong…and this time I played even worse. Poipu Bay, opened in 1991 and host of the PGA Grand Slam of Golf between 1994 and 2006 (with Tiger Woods winning seven of the 13 events), is really a very fine course with a number of very good holes. I still think the description ‘Ocean-links style’ is a bit of a stretch because you aren’t aware of the Pacific’s proximity for much of the round, but the holes where the ocean is a feature are absolutely terrific, while many of the inland holes are excellent neighbors. Though not raging exactly, the wind this time gusted to 20-25mph making for some difficult, but fun, shots. I’m told it was a fairly standard wind, so you would certainly be doing yourself a favor by working on your knock-down shots prior to teeing it up here. The tricky par 3 13th. The greens, as at so many of Kauai’s courses, are now Seashore Paspalum having been converted from Bermuda in 2012, and they roll beautifully. The pick of the holes is surely the grand, par 4 16th which sweeps right to left with the ocean cliffs a botched pull or hook shot away. The 18th is a fine par 5 to close, with a pond short and left of the green. It was here that Phil Mickelson lipped out for a 58 in the 2004 Grand Slam of Golf. Choker! Rack Rate - $250 (after 11am - $170, after 1pm - $135). Grand Hyatt guests - $180. 5,241 yards – 7,123 yards. The wonderful par 3 6th. Because their wow factor is significantly greater, you’ll probably remember Makai, Poipu Bay and Hokuala for longer following your trip to Kauai than you do Puakea. It doesn’t have the dramatic ocean views of the other three, and nor does it offer their high-end facilities and impressive clubhouses. What Puakea definitely does have though are some excellent holes that play west toward Kauai’s interior mountains and jungle (it doesn't rely on eye candy so much as sound architecture), plus a really interesting history. Nelson, who had a hand in the creation of a third of Hawaii’s approximately 90 courses, was building Puakea in 1992 when Hurricane Iniki blasted through, severely impacting the local economy and halting construction. Five years later, Puakea opened as a ten-hole course, after which Sports Illustrated rather curiously named it one of the US’s top nine-holers. Nelson played it dozens of times during this period, figuring out the typical wind direction, identifying the best views, and storing up ideas for if and when the course’s owner - Grove Farm Company, headed by AOL founder Steve Case – decided to complete the full 18. Nelson was given the green light in 2002. He made the changes and built the new holes that resulted in today’s configuration, which opened in 2003. The opening quintet plays through suburban Lihue and won’t get you terribly excited. 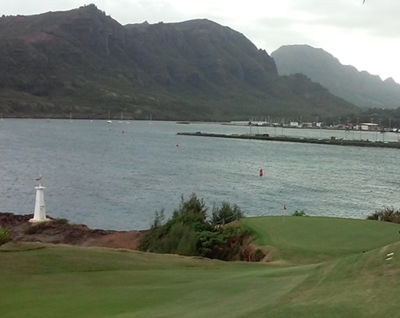 But when you stand on the tee at the 6th, look out towards the mountains and Jurassic Park country, then down to the green 176 yards away behind a beautiful pond, the eagerness you felt at Makai and Hokuala (assuming you played those first, of course) will come flooding back. It’s a gorgeous hole and a definite highlight of your stay on the island. Make a three, or even a two, and you’ll remember it for years. The superb par 4 12th. There’s a danger Puakea peaks here but, while there may not be another heart-stopping moment quite like that at the 6th, there are plenty of good holes remaining - none better than the par 4 12th which skirts a very large mango tree and pond on the right. The following hole – an excellent par 3 of 228 yards – is another beauty. General Manager and superintendent, Dan Urwiler, is currently overseeing a change from Bermuda to Paspalum on the greens, a few of which were in the middle of the transition, and therefore a little bumpy, on the day of our visit. Those Urwiler began working on a few months ago, however, are rolling superbly well and, given a few more months, Puakea will have as fine a set of putting surfaces as any course on the island. And with a green fee set at less than half of what Kauai’s better-known courses are charging, you’ll be very glad you came. The 17th - not your typical muni course view. Old golfers will tell you their favorite thing about the game besides birdies, skins, and post-round beverages, is coming across a terrific but largely unknown course with an affordable green fee. I give you Wailua GC, five miles north of Lihue on the coastal Highway 56 and owned by the County of Kauai. 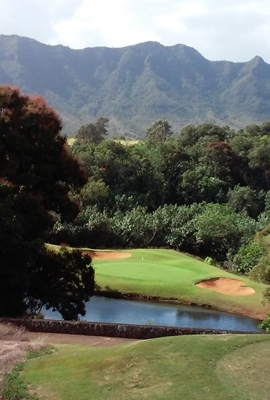 Wailua’s first nine holes were laid out in the late 1930s. Kauai golf legend and Hawaii Golf Hall of Fame member Toyo Shirai redesigned them in 1962 and added nine more, transforming Wailua into a splendid course the USGA has used three times for the US Men's Amateur Public Links Championships (1975, 1985 and 1996). 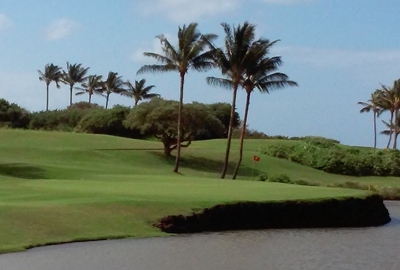 Wailua is so good, in fact, former USGA Executive Director Frank Hannigan once said it could make a claim to be America’s best publicly-owned course. Hannigan was surely forgetting the likes of Bethpage Black and Torrey Pines South, but there’s no denying Wailua is a cracking round full of excellent holes. And the greens are just too good for a $48 (non-resident green fee) muni that records well over 60,000 rounds a year. The front nine is fairly flat, but kinks in the fairways and some mammoth bunkers provide plenty of interest. The back nine possesses a bit more movement in the ground, and is where you find most of the course’s more memorable holes – like the intriguing par 5 13th, tree-bound par 3 14th, and 173-yard 17th which plays from a high tee to a green wedged between large bunkers and the beach. Local residents pay $60 a month for unlimited golf at Wailua which is insanely good value, and just the sort of motivation you need to purchase that condo/beach hut on Kauai. Green fee - $48 for non-residents during the week, $60 at weekends. The twilight rate is 50% of the daily rate, and visitors can buy a five-round Play Card for $215. Kiahuna is a lovely Robert Trent Jones Jr. design (yes, Jones has been pretty active on Kauai) a mile or two west of Poipu Bay. It opened in 1984, and was the first course I ever played with Paspalum greens. Having watched putts roll smoothly all day, seen the attractive emerald green of the turf, and learned these surfaces could be irrigated using salt water (Kauai courses typically use salt water to kill weeds knowing the Paspalum will survive), I wondered if every course in the world might one day re-seed with Paspalum (that can't happen given the vagaries of soil, location, climate, budgets, etc. but it was a nice thought). Kiahuna is fairly exposed to the wind in places, and takes you past a couple of very interesting features. Lava tubes to the left of the 2nd fairway are home to the eyeless Koloa Blind Wolf Spider which, despite its rather intimidating name, is actually harmless. 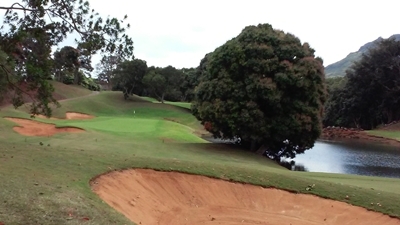 The remains of a Hawaiian village can be seen to the left of the 11th fairway, and the beautiful Waikomo Stream affects the 12th and 13th holes. What is left of a 200-year-old stone house, that once belonged to a Portuguese immigrant, sits beside the fairway at the 15th. Rack Rate - $95. Twilight (3pm-6pm) - $60. Nine holes - $60. 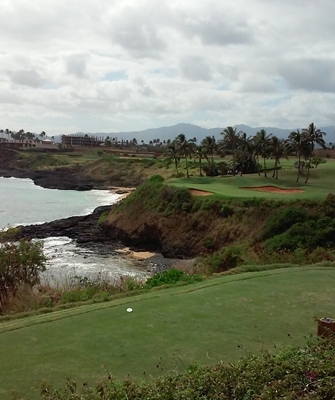 Kukuiolono is a nine-hole course about five miles west of Kiahuna that costs $9 to play. Hardly worth the effort to Google, right? Not so. Read the reviews from players who couldn’t believe their luck at having stumbled on the place. The views to the south and west are magnificent, and far from being the unkempt pitch-and-putt most people expect when they turn up, the course benefitted from Toyo Shirai’s expertise, and actually provides a couple of hours' of amusing golf. Walter McBryde, founder of the McBryde Sugar Company, built Kukuiolono for his own recreation, but donated the course to the island in 1919. You can thank him as you pass by his grave on the 8th hole. If you’re wondering why there's no mention of the Prince Course at Princeville, it’s currently out of action while the owners decide whether or not to make it private. I'll be writing a full report, with some ideas about lodging, dining, travel, and non-golf activities, for an upcoming issue of Global Golf Post.